Skip the complications and head straight for the comfort and freedom of a complete energy system. This multifunctional energy system brings together a powerful sine wave inverter, a sophisticated battery charger, a high-speed AC transfer switch and AC distribution in a single lightweight and compact enclosure, which cuts down on the time required to install and eliminates pesky technical procedures that could crop up for the novice installer. The result is a seamless installation process with a control cabinet that works hard -- though you'd never be able to guess! 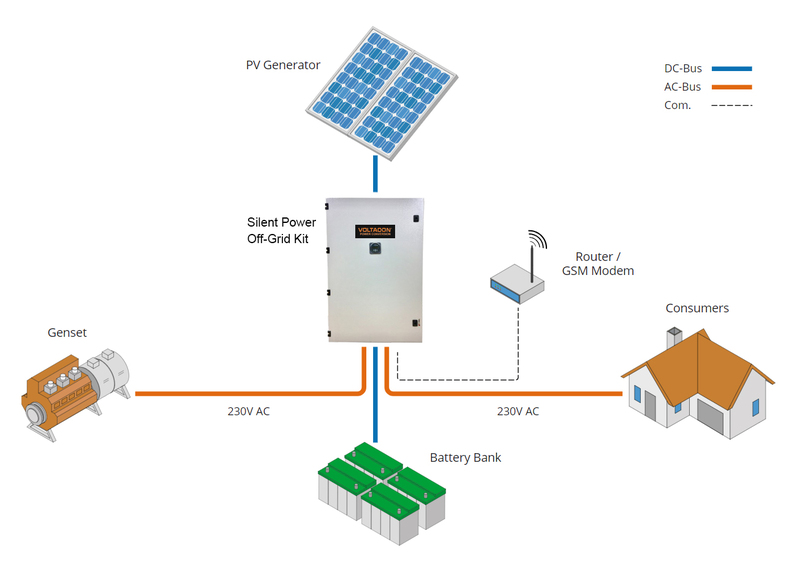 Every Silent Power Off-Grid Photovoltaic Control Cabinet is designed with a state-of-the-art battery monitoring system with added Bluetooth connectivity. Access temperature and energy status updates and avoid premature failures via any Android-based mobile phone. To get started, simply connect the solar panel and battery cables to the protected power terminals of the cabinet. The Silent Power Off-Grid Photovoltaic Control Cabinet is a complete system that focuses on energy but keeps the user at the centre of its design. Voltacon developes plug'n'play off grid control cabinets that are made in UK for continuous 230VAC power supply. The main power conversion system is our Conversol inverter/charger with active output power 10000VA/10000W, the MPPT 80A solar charger and the battery monitor from Victron (BMV-712). In this version, we have added the parallel function for easy expansion up to 45kW (equivalent to 9 inverters). Victron BMV-712 with Bluetooth, battery monitoring. and wall plugs are included. DC Disconnector, 100A, size 00, 80Vdc max.